FELT THIS! Mini Masterpiece class-Saturday!! WOW-January is off to a wonderful start-first class of 2015 was on the 10th, and we had a great little group of needle felters stabbing some fun creatures into existence! Then Winter Woolfest in Wamego last Saturday where friends, fun, and fibery fabulousness was had by all. 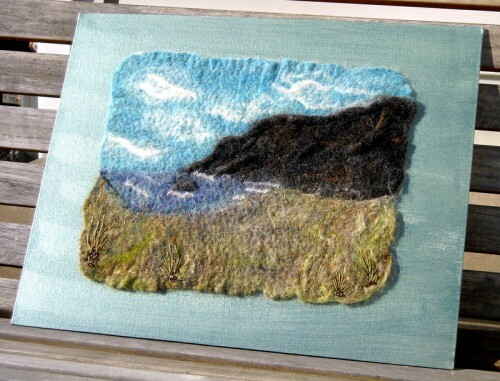 And next Saturday, the 24th, we will be creating mini felt paintings based on landscape pictures! I am so excited to see what everyone creates! I would love to see this class be full beyond belief! All you will need is a simple picture for inspiration, and a couple of old towels to transport your completed painting home after class. You can do this-and the colors and textures that you will have to select from will amaze you…so come join us!